There are a lot of strange things going on in the world regarding masculinity and what it means to be a man. One of the questions I get all the time is, “Is there really an attack on masculinity?” I believe there is but at a minimum, there is certainly a dismissal of it. Unfortunately, much of the animosity towards men is somewhat warranted. Now, granted, we’re never going to completely do away with the negative perception of men for a couple reason. First, some men will continue to behave in a manner that does not accurately reflect our role and responsibility in society. Second, some people will continue to use those exceptions in order to paint a broad brush of the supposed inherent danger of masculinity. Regardless, we have an opportunity to focus on the external, which is how we’re perceived, and we should. We need to address false allegations of scrupulous behavior, the broad dismissal of and attack on masculinity, and the court system who seems to be targeting men in an attempt to destroy them and their families, to name a few. But equally important is our need to focus on the internal – ourselves. When we learn to focus on ourselves and how we’re showing up in our families, businesses, and communities, much of the way we’re viewed and honored as strong, contributing men will take care of itself. Besides, the focus on ourselves is really the only thing fully within our control. The best foundation for focusing on ourselves is to articulate, define, and live by a code. A code is an operating system. It describes the way you behave, engage, and show up. I’m talking about identifying and articulating a code that you feel is meaningful and significant. This isn’t about me telling you the way you “should” do it. It’s about arming you with the tools and information so that you can identify and live by your own code. Your code needs to be written. It needs to be articulated. I suggest that it be on one page. It doesn’t need to be a document. It doesn’t need to be a book or even a chapter of a book. It just needs to be one page that clearly articulates the most important things to you, not everything that’s important to you. It’s been proven that goals and objectives that are written down are more likely to get accomplished. The same holds true with a code. Does it really even exist if it isn’t documented? It might be to a degree but certainly not as solidified as if there is written documentation of your code. Get a piece of paper, a journal, or your computer out and list out the virtues, the qualities, the characteristics that you value above all else: strength, honor, integrity, sacrifice, commitment, family, exercise, health, wealth, abundance, mindset, etc. Don’t eliminate anything from your potential list. Don’t narrow this down at all. All you’re doing right now is brainstorming. Now, once you have this list of all the things you value, start narrowing it down. Consider this as a funnel. There are going to be some things, honesty and integrity for example, that are very similar concepts. Do you need to list both? Probably not. Is there one overarching virtue that you could use that would whittle that down into one? If you list everything that you could possibly value in your life, it’s going to be too long. You need it to be short. You need it to be punchy. You need it to be strong. You need it to resonate with you at an emotional level and the only way to do that is getting to the absolute core of what you value, not everything you value. Again, list out virtues. This is number two. List out your virtues, qualities, and characteristics, and then narrow them down into the ones that are most important. Now, I think this is important, and as I was thinking about what I wanted to share with you today, I was judging what I was going to share according to the code that me and my sons had written. What I suggest to you is that you write these statements, and they should be statements. Once you have the virtues and qualities and characteristics that you value, now you should turn those into sentences, but they should be statements. Instead of writing out one of your codes as, “I will be disciplined,” write it as “I am disciplined. It might be a small adjustment in language but I believe the things we tell ourselves is powerful. I also believe that we are constantly trying to find congruency between the way we view ourselves and the way we actually behave. So, if you tell yourself you are already a certain way, your behavior is likely to reflect that. It’s not enough to write this down once and file it away in your filing cabinet never to refer to it again. You have to refer to this thing often. Right now, I’ve got my code of conduct sitting right on my desk. I’m going to have it framed, and it’s going to sit right above my desk so I can read it and refer to it often. You need to internalize your code. It needs to be part of you. It needs to be you. Refer to it often, have it somewhere in a location where you can see it. If you’re including your family in this process, I would consider incorporating this into discussing your code and even memorizing it with your wife and kids. This is not a one-and-done, set-it-and-forget-it document. Things change. You evolve. You grow. Priorities shift from time to time. You need to be able to be flexible, not so rigid in your code of conduct that you can’t take in new information and new ways of seeing the world and the way you interact in it. Now, there should be some rigidity to it in that you’re not just manipulating it to get what you want or to do what you feel like you should be doing in any given moment that goes against what you know is a value of value. But you should be able to evolve, grow, and expand. Those are the five steps. This is not a complex process. This is not something that needs to be overthought or overanalyzed or over-scrutinized. Very simply, any great organization, family and, frankly, man has a way in which he will live his life. It’s not blurry. It’s not something he can’t clearly articulate. He knows exactly what he stands for at any given moment. And, because he knows exactly what he stands for, and exactly what he will not stand for, he’s able to make the best decisions in the heat of any given moment. When he’s tempted to go against what he values, he won’t because he’s clearly identified what is important to him and how he will behave. 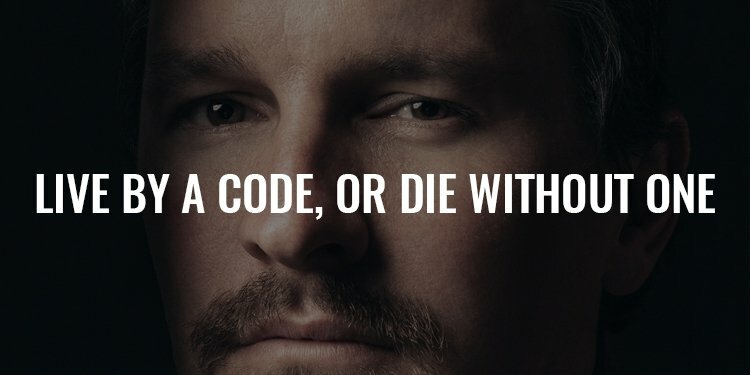 Live by a code or die without one. I hope I’ve adequately articulated the importance of having a code, an operating system. Having a code has been invaluable in my life, and quite frankly, knowing what I stand for has served as the catalyst for growth, expansion, and all good things in my life.